Whatever your interests and skill level, New York offers a wide variety of cross-country skiing options. You want to head into the backcountry and earn your turns? No problem. Groomed, big uphill and screaming downhill? Yeah, we’ve got that covered. Moderate trails with awesome views, with a nearby brew pub for après-ski? Check. What are you looking for? Close to New York City, Lake Minnewaska offers skiing on carriage roads built in the era of 19 th century resort hotels. On the other side of the river, Fahnsestock has a small, pretty trail network. In the Catskills, Mountain Trails has narrow trails through pine forests with an old school vibe. In the Southern Adirondacks, Garnet Hill lures you with buildings reminiscent of the Adirondack great camp era. Easy cruising trails mix with the appealingly named Skullbuster. There’s even shuttle bus service to haul you back from a long downhill cruise. In the High Peaks, get a taste of Olympic tradition at Mount van Hoevenberg, site of the 1980 Winter Olympics. They still have maps of the Olympic race courses in the lodge; you can test yourself on the same loops that Koch, Wassberg and Mieto raced in 1980. The ski centers above are just a sampling of what’s available for your skinny ski pleasure. Like alpine, there are nordic skiing options statewide. If you’ve got one place that’s you’re regular ski center, share the love and explore some of the ski centers listed by NYSkiBlog. 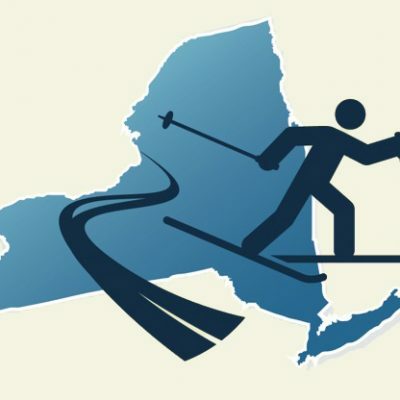 Peter Minde is the editor of NYSB’s Nordic Ski Area Directory. He is a personal trainer certified by the National Academy of Sports Medicine (NASM) and a knowledgeable and dedicated nordic skier.